Insteon home automation basics | What is Insteon? This page covers basic features of Insteon technology. It covers Insteon PHY layer, Insteon signal, Insteon network and Insteon home automation concept used in IoT(Internet of Things). INSTEON technology is a trademark of INSTEON Inc. US. It enables simple low-cost devices to be networked together using the powerline, radio frequency or both. All INSTEON devices are known as peers. This is because any device can transmit, receive, or repeat the messages from other device. In doing this, devices neither require any master device controller nor any routing software. More are the devices in the INSTEON network, more stronger is the INSTEON signal. Following table mentions features of the INSTEON technology used widely for Home automation and in IoT(Internet of Things). 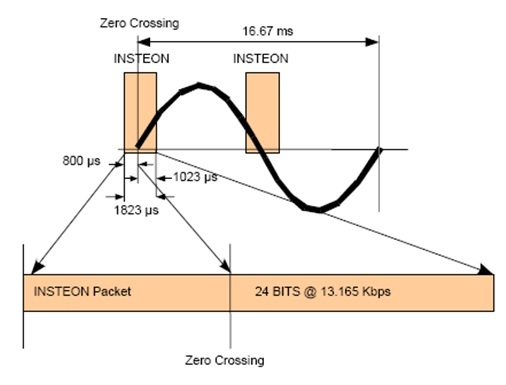 The figure-1 depicts INSTEON signal. Following are the characteristics of it. • It uses 24 bit packet. Devices in the network communicate using INSTEON protocol over the air via RF and over powerline using powerline protocol. Figure-2 depicts typical installation of INSTEON home automation system. Electrical power is distributed to homes in North America by splitting of main power line of 220Volt AC. Hence there will be pair of two-wire 110VAC powerlines referred as phase-1 and phase-2. The phase-1 takes care of half of the area in home and another phase-2 takes care of second half area. INSTEON RF devices communicate with the other using RF protocol. 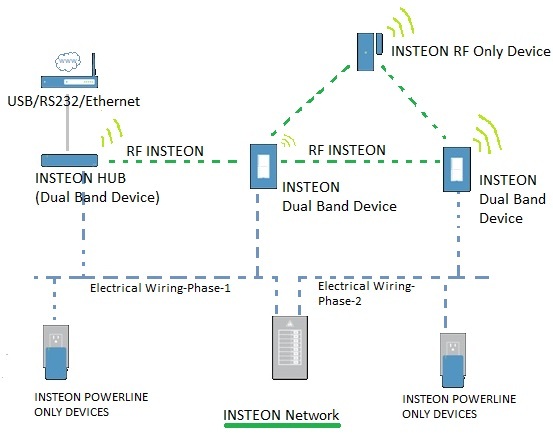 INSTEON powerline devices communicate with the other PL devices using INSTEON powerline protocol. INSTEON dual band devices takes advantages of both protocols and will be able to communicate with both the type of devices. This concept of INSTEON home automation is widely employed due to availability of powerline and radio frequency technologies in the Home.